Did you know the Royal Kerckhaert Horseshoe Factory has changed the way we are shoeing our horses on a daily basis? In 2015 the Royal Kerckhaert Horseshoe Factory created a sensation amongst farriers, when we first introduced our unique, innovative Liberty Cu horseshoe nails. Liberty Cu have surpassed the rest, because they are the only horseshoe nails in the world made with Copper (Cu) Shield Technology™. This provides much more protection than traditional horseshoe nails, for stronger & healthier hooves. Hoof wall, white line and sole are stronger and healthier, when used on a daily basis. In 2016 two independent studies on Liberty Cu horseshoe nails have confirmed these benefits.  Cu Shield Technology™ is unique to Kerckhaert. The same technology that was first developed for Liberty Cu horseshoe nails, is also used on the Super Sound Cu race plates.